WHEN: Saturday, February 13, 2010, 6:00 p.m. COST: $100 early registration, $125 each at the door. It's that time of year again, one of our favorite charity events that we all attend every year. 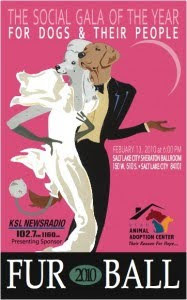 Please join us and our pups at the annual Fur Ball!! We would love to see you there. There will be items up for auction from Ruffledale.. Please come and support a great cause. 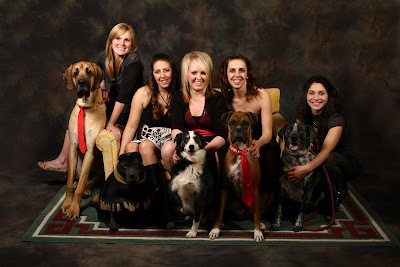 February Dog of the Month: Booger!!! 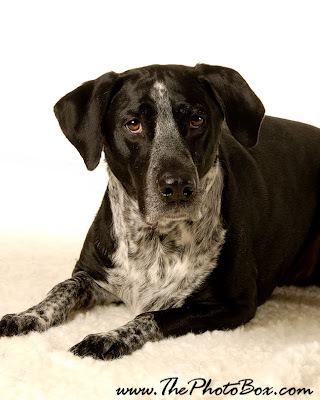 Booger, (AKA “Boogie” or “Boogitty”) is a 5 year old Lab and Pointer mix. He is a regular here at Ruffledale and has been coming since Ruffledale opened its doors. Ruffledale is Boogers’ “Home Away From Home.” Most of the time when clients come in they don’t even know Booger is here! We can put all of the dogs in the back and leave Boogie up front and he won’t move from his spot on the couch. He LOVES to sleep and is happy just relaxing for all of the day, every day! Boogers’ ideal day would be as follows; Sleep, Eat, Sleep, Treat, Sleep. Perfect!! Booger loves to have his belly rubbed. He will just roll over where he is laying and let you rub his belly all day if possible. Booger got his name from his first time home. When his Mom adopted him, he had a really bad case of Bronchitis. He was very sick and full of green Boogers! Hence he got his name. Now it fits him because he is a naughty little booger!! But we all love our Boogitty. Ruffledale wouldn’t be the same without Booger on our couch! Because Boogie was so sick, all he wanted to do was cuddle with his new Mom who rescued him. Now he still loves to cuddle with her in bed! Booger loves to eat! It is the most important thing to him and his favorite thing is Cheez its! (of course dog food is pretty good too!) Other favorite treats are anything that is left on the counter when his Mom leaves, canned food the other dogs at Ruffledale are supposed to get, Chew Bones, and especially when his mom Home cooks him chicken and rice with pumpkin! Mmmmmm. Yes, he is quite spoiled! Sometimes Booger even likes to eat things he shouldn’t like the Squeakies out of his toys after he shreds them!! He has gotten a couple trips to the vet from eating those. Even some X-Rays to make sure they are moving through the way they should. Since those are his favorite, his Mom can’t let him have toys any more with a squeakie in them. Poor Booger. But he also loves to chase lasers, and loved the one he got for Christmas from Ruffledale. Boogie loves all animals. Dogs are great, but he really loves Cats. Booger thinks of Cats as “Laura’s” because his Aunt Laura had a cat and whenever his Mom asked him if he wanted to go see Laura he would get excited to see the Kitty. Now if you ask him where the Laura is he starts searching around for a Cat to play with. Everyone here at Ruffledale loves getting to have Boogie around. He is such a staple here at Ruffledale, that without him we wouldn’t know what to do!